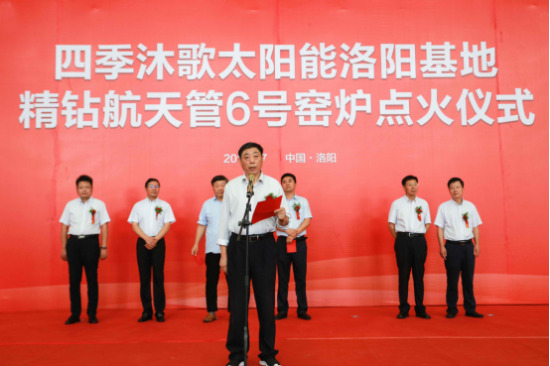 On July 28th, the No.6 kiln of the Fine Diamond Aerospace Tube of the Four Seasons Muge Solar Luoyang Base was successfully ignited, becoming the annual event of the solar thermal utilization industry in 2018, and also released a benign signal of the recovery of the solar thermal market. 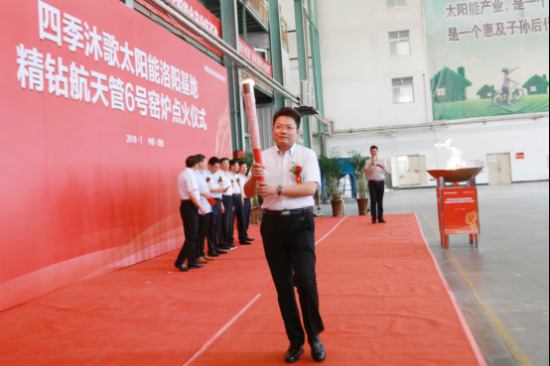 On the morning of the same day, the torch symbolizing the glory and dreams of the people of the heat was passed between the industry experts, local leaders, and business leaders. The raging flame finally ignited in the No. 6 kiln of the fine diamond space tube, detonating the scene climax. Director of China Solar Thermal Utilization Committee, Zhang Xiaoli, Executive Director of China Solar Thermal Utilization Industry Alliance, Jia Tieying, Director of Solar Energy Professional Committee of China Energy Conservation Association, Wang Qingxuan, Deputy Director of Management Committee of Luolong High-tech Zone, Henan Province, Jiao Qingtai, Chief Engineer of Four Seasons Muge Group, Four Seasons Yang Heping, general manager of Mu Ge Luoyang Solar Energy Co., Ltd., Gu Mingjun, deputy general manager of Four Seasons Muge Luoyang Solar Energy Co., Ltd., Rong Huangrong, general manager of Four Seasons Muge Group Hot Water Company, and others completed the feat. Previously, industry survey data showed that since 2013, the concentration of solar thermal industry has increased, and the market structure has undergone major changes. At the same time, the adjustment of the structure of the solar thermal market has also prompted the industry to shuffle, the market is raging, leaving behind They are big brands that have the strength to lead the industry to upgrade and evolve. In the first half of 2018, thanks to the hot water, engineering, and new retail troika, the sales of the four seasons of Mu Song achieved a new growth. In order to meet market demand, kiln ignition, optimization of capacity upgrade is imperative. Yang Heping, General Manager of Four Seasons Muge Luoyang Solar Energy Co., Ltd.
Yang Heping, general manager of Four Seasons Muge Luoyang Solar Energy Co., Ltd. introduced that the Four Seasons Muge Luoyang Base has the first domestic full-industry chain space production line, which can simultaneously develop and produce 'all-glass vacuum heat collecting tubes', 'all glass heat pipes', 'glass metal sealing' Heat pipe 'and 'flat collector' four solar collectors for solar collectors. The successful firing of the No. 6 kiln in the four seasons of Mu Song Solar Luoyang Base will further enhance the production capacity and new generation of the Four Seasons Muge. The quality of the fine diamond and space tube's, the quality and quantity to meet the new market demand. The successful ignition of the No. 6 kiln of the fine-drilling space tube of the Luoyang base in the four seasons of Mu Song Solar is not only the individual behavior of the enterprise, but also the benign signal of the recovery of the solar thermal industry. According to Zhang Xiaoli, director of the China Solar Thermal Utilization Committee and Jia Tieying, director of the Solar Energy Professional Committee of the China Energy Conservation Association, the current solar water heating application is still the mainstream business sector of the solar thermal utilization industry, and is also the mainstream project of comprehensive enterprises. In 2018, China's solar thermal utilization industry under the guidance of the “13th Five-Year Plan for Solar Energy Development”, the construction hot water project maintained steady growth in the first half of the year; the concentration of vacuum tube production increased significantly; the sales volume of flat panel collectors continued to rise; Construction has also promoted the upgrading of domestic hot water systems in some areas. Obviously, the solar thermal industry is moving towards more stable, efficient, high-quality, innovative development. 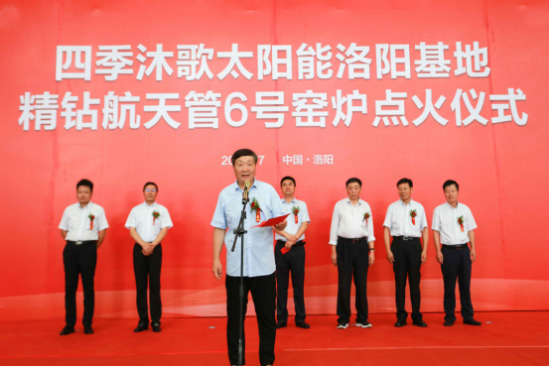 The ignition ceremony is a response to the 13th Five-Year Plan for the solar thermal utilization industry, China Manufacturing 2025, and has injected a 'cardiotonic agent' into the positive development of the industry to raise public awareness of solar energy products in the new era. Expanding the application range of solar thermal energy and promoting industrial development are of great significance. 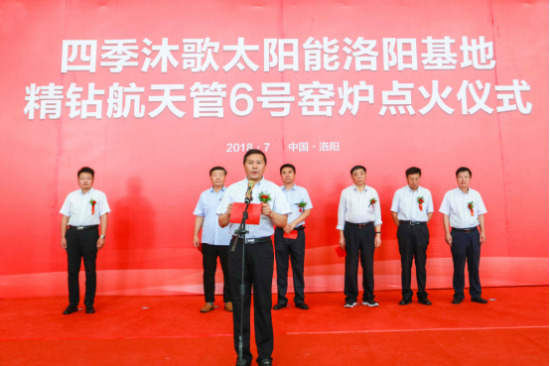 Zhang Xiaoli said that he hopes that the four seasons of Muge can continue to maintain high standards and high requirements, continue to shoulder the responsibility of the industry, continue to adhere to technological innovation, production upgrading, and become a solar thermal industry. The promotion and promotion platform will push better solar products to thousands of households. In fact, as early as 2016, China's solar thermal industry was confused and the pace was swaying. 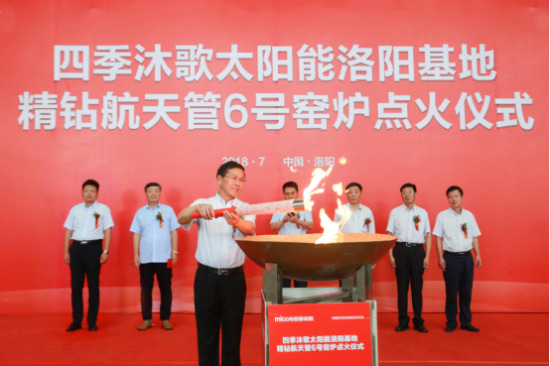 Four seasons Muge held a igniting ceremony for the No. 5 kiln in the fine-drilling space tube in conjunction with a number of institutions. The counter-truck drainage detonated the industry. Energy has revived industry confidence. As China's solar thermal industry ushers in a new round of development opportunities, the Four Seasons Mu Ge Fine Diamond Space Tube No. 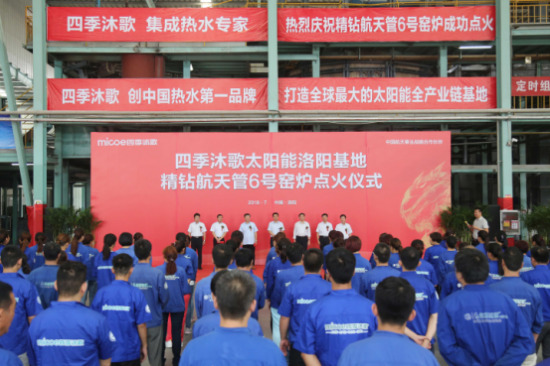 6 kiln once again ignited the flame, which means that the Four Seasons Mu Song Solar has embarked on a new journey, which means The beginning of a new era in China's solar thermal industry will guide the people who are hot to find new glory and dreams. In recent years, Four Seasons Muge has dispelled consumers' doubts about the 'good use of solar water heaters' through continuous product innovation and upgrades, which has revived consumer confidence. Through continuous kiln ignition and expansion operations, it has dispelled the concerns of enterprises. , boosted the confidence of the industry; through a series of online and offline marketing activities such as 'Tmall & Four Seasons Mu Ge Bathing Culture Festival', the sales volume has been continuously increased, and the market confidence has been invigorated. In the future, Four Seasons Muge will continue to fulfill its corporate mission, be guided by consumer demand, provide more comprehensive care for more consumers, more cutting-edge products, and more intimate services, so that Chinese families can enjoy the benefits of solar technology. good life.